The Skinny: Comprised of four supernatural stories, Kwaidan ranks as one of the best horror anthologies of all time. 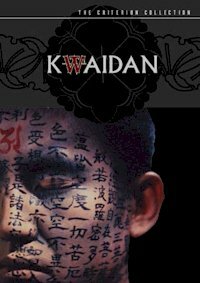 Kwaidan is comprised of four stories introduced by an unseen narrator. The first story, "The Black Hair", and the last one, "In a Cup of Tea", are good but it's the two middle tales that make Kwaidan a great film. The first of the two middle tales is called "The Woman of the Snow." It concerns an apprentice woodcutter named Minokichi (Tatsuya Nakadai), who has a frightening experience during a blizzard involving a spectral woman and a broken promise. It is the best of the four stories, combining expressionistic sets with moody lighting and gorgeous cinematography. The soundtrack for this segment contains little to no music and relies heavily on sound effects for emotional exposition. Of the four stories, it possesses the best acting, and is a truly poetic and tragic piece. However, the centerpiece of Kwaidan is "Hoichi the Earless." It is longer and slower than the other stories, but it more than compensates with a lot of inventive visuals. Hoichi (Katsuo Nakamura) is a blind biwa player who is summoned nightly by the spirits of the dead Genji and Heike clans to sing and tell the stories of their battles. Soon the Priest (Takashi Shimura) he resides with becomes wise to the situation and an attempt is made to protect Hoichi by painting him from head to toe with religious scripture.